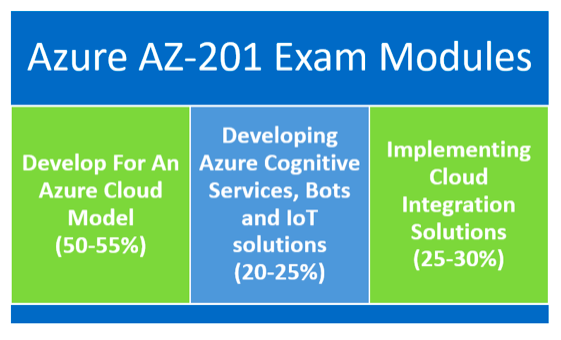 Blog Microsoft Azure How to Prepare for Microsoft Azure Exam AZ-201? 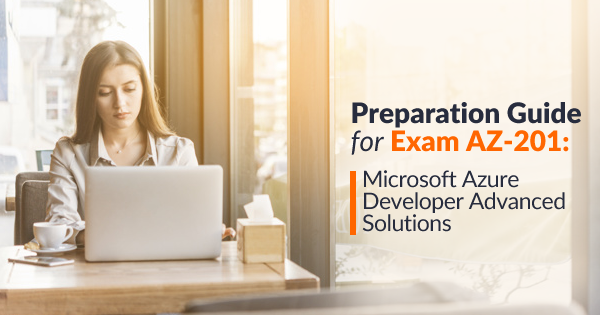 We’ve already discussed the steps to advance through Azure AZ-200 exam preparation for becoming a Microsoft Certified Azure Developer. AZ-200 is merely the first step towards that journey. In order to become a fully qualified Azure developer, you’ve to pass one more exam: AZ-201. 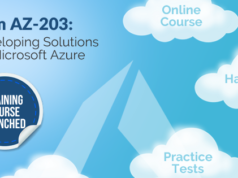 This azure certification exam preparation can be done along with your AZ-200 preparation. It’s because there won’t be any major differences in the exam structure or the type of questions asked in an AZ-201 Exam that from an AZ-200 exam apart from study modules. So it’s better to start AZ-201 exam preparation along with preparation of AZ-200 exam. In AZ-201 Exam, questions can come from 3 main sections. Although the weight assigned to each of these sections varies considerably, you can’t neglect any of these sections in your AZ-201 exam preparation. The sections are described below. By far, this is the module in AZ-201 exam which has the highest allocation of questions. Around 50-55% questions in the total exam will be based on this section. You can find subtopics in the section as shown below. Try to understand the details on each and every subsection in your AZ-201 exam preparation as it’ll definitely help you to score more score in the exam. This section contains topics such as managing APIs using APIM, configuring message based integration architecture and finally, developing an application message model. The weight of questions in this section is around 25 to 30%. As the title implies, it requires the candidate to know things such as integration of Azure cognitive services in application, creation & implementation of IoT solutions and creations & integration of bots. This section’s weight is around 20 to 25%. Prerequisites for the exam is exactly the same as AZ-200 exam. You need to have prior experience in all phases of development including solution design, development & deployment and testing & maintenance. Expertise in one cloud supported programming language is a must. Besides, the person should have proficiency in developing applications using Azure tools that span around networking, storage, security and compute. They should be able to partner with solution architects, cloud administrators, clients, and DBAs to develop formidable cloud products. If you are looking for an authentic preparation guide for Microsoft AZ-201 exam, we always recommend starting with Microsoft Official Learning portal. Here, you will find details on all the necessary AZ-201 Developer Advanced Solutions exam study materials that are important for your AZ-201 exam preparation. You can know the exact pricing information for the exam from this page. There’ll be options to schedule the exam, links to external AZ-201 exam preparation options, skill measured in this exam and the basic prerequisites needed to appear for the exam. Additionally, you can find exam study group discussions on this page. Whenever there’s a change in exam schedule or structure, it’ll first appear on this page. For beginners, it’ll be difficult to find a better preparation guide for Microsoft AZ-201 exam than the official website portal. If you aren’t satisfied with that, go and search in Goodreads or Google Books for additional books. But, there are fewer chances for finding books on this topic since the exam is fairly new and still in beta stage. So, it’s better to concentrate on discussion forums and study groups for the time being, until you find some convincing AZ-201 exam study guides. 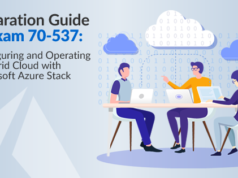 Considering the less availability of resources such as books and study guides for your Microsoft AZ-201 Developer Advanced Solutions exam preparation, Microsoft has provided a section namely “Study Group” in their learning portal. 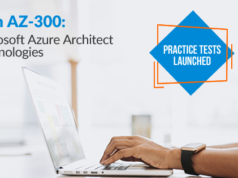 If you don’t have a prior Azure exam experience, it’d be the best way to resolve your queries and doubts regarding this AZ-201 exam preparation. Here, you can find people who’ve previous experience in azure exams including role-based exams. They might be capable of solving your questions regarding this exam. If you are unable to find answers to your queries in the study group, try to check some other forums like Azure community, MSDN forums, etc. You’ll get assured support from any of these. To support your AZ-201 exam preparation, Microsoft learning platform is offering instructor-led training in association with its partners. This training is available for each and every module in AZ-201 program. To enroll in such a course, you need to find a Microsoft certified classroom training partner in your geographic location. All the links of this training can be directly accessible from Microsoft Learning page itself. For most of the azure certification exam preparation, Microsoft provides links to sample test papers. However, for AZ-201, such a test isn’t available till now. In case you don’t want to take the beta test right now, you need to wait some time for sample test papers appear in this page for your AZ-201 exam preparation. You’ll know all the types of questions that can be asked in a typical AZ-201 exam by taking such a sample test. And unlike beta tests, the results of practice tests will be published instantly. 1. What’s the cost of taking the exam? The cost of taking this exam varies from country to country. If you’re living in the United States, you’ve to pay $165 as per Microsoft latest update. For the United Kingdom, this price is £113 and for India, it’s Rs. 4800. You’re eligible for a discount fee if you’re a Microsoft certified trainer or a member of Microsoft Partner Network program/Microsoft Imagine Academy program. Students are also eligible to get fee reduction if they can provide valid educational documents. 2. When will be my exam results available? Since the current AZ-201 is in beta stage, you’ve to wait for at least two weeks to get the results. You can find the results either on Exam provider website or on your Microsoft transcript. 3. What’s Microsoft’s policy if I choose Brain Dumps for my AZ-201 exam preparation? Microsoft considers the content delivered in brain dumps as fraudulent since that content is almost the same or similar to items appearing on the exam. It can even lead to revoke a candidate’s certification and prevent him/her to take any Microsoft exams in future. So, it’s always a good idea to stay away from such practices. 4. What’s the exam structure of az-201 that I’ve to take? Any Azure role based developer exam including AZ-201 can contain around 40 to 60 questions. You’ve 150 minutes to complete the exam. There can be multiple question types such as review screen, mark review, short answer, repeated answer choices, multiple choice, hot area, drag and drop, case studies, build list, the best answer, and active screen. There are no negative marks for incorrect answers as well. 5. Is it possible to review my answers before completing the exam? For most of the questions in AZ-201 exam, it’s possible to review the answers before leaving a section or completing the exam. However, there can some yes/no questions you can’t review once it’s marked. 6. What’s the official cut-off or the marks I need to score for passing the exam? Microsoft has explicitly set a pass mark of 700 for all the tech-based exams. Any score greater than or equal to 700 is considered as pass. 7. What’s the option for me if I didn’t pass? Can I retake the exam? If you took a beta exam and failed on it, you can’t take a beta exam again. However, you can go with the main exam when it’s available. But every time you retake the exam, you have to pay the full exam fee (Not the beta exam free). Exam scheduling for retakes can be done as you normally do. 8. What’s Microsoft’s re-evaluation policy on AZ-201 exam? Even you submit your score for re-evaluation, your pass/fail status is not subject to change under normal conditions due to Microsoft’s strict policy to maintain quality on each domain in the exam. However, you can submit an online request to Microsoft, if you feel as there’s a technical error with questions or score. There are no Microsoft AZ-201 Developer Advanced Solutions exam preparation materials guarantee a 100% success in the exam unless you’re determined to do it. The exam can be either difficult or easy – which you can’t make any control over it. But with the right AZ-201 Developer Advanced Solutions exam study materials and adaptable exam strategies, you may find that it isn’t as hard as you imagine. 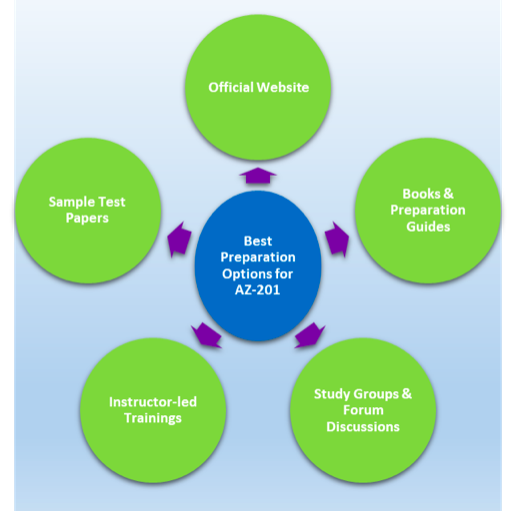 All you have to need is to formulate a solid preparation strategy along with a definitive AZ-201 exam study guide. Prepare for AZ-201 exam now and take the final step to become a Microsoft Certified Azure Developer Associate. Wishing you all the best for the exam!